Long-distance business relationships often rely heavily on the use of emails or the telephone. These forms of communication prevent parties from developing rapport and fostering human “face-to-face” relationship. Consequently, it is very difficult to build trust in online or virtual communications. Negotiators who communicate predominantly online—particularly in the preparation stage of a negotiation—should consider the usefulness of video conferencing. With the increasing use of technology and faceless communication, video conferencing allows negotiators to build a relationship and lay a foundation of trust. This foundation of trust will be essential during later stages of the negotiation. • Know when to pick up the phone (or use video conferencing). When time is of the essence, an e-negotiator should consider that people talk much faster than they write or type. People also exchange more than three times the information exchanged in a face-to face interaction than in online interactions; additionally, because email communication tends to be non-task relevant, the discussion is inherently less efficient. The exchange of information is crucial to reaching the optimal social outcome for the relationship and subsequently for the negotiation deal. Consequently, e-negotiators should consider avoiding online communications in certain situations. Avoiding email will save an e-negotiator time and allow individuals to exchange more information. • Use video-conferencing to build trust. Building a relationship of trust is extremely important in negotiations. However, it is often difficult to establish trust in a purely online setting because text-based mediums lack nonverbal cues and make it especially difficult to develop interpersonal connections and build trust. Without nonverbal cues, it is more difficult for a party to detect deception and bluffing; on the other hand, an individual may feel less guilty about exploiting or hurting a “faceless” individual. Consequently, an individual is more likely to exploit or fear exploitation by the other party in the absence of a relationship of trust with some accountability. One way to humanize oneself and build trust is to use video conferencing. The availability of Skype webcams or Gchat video allows individuals to communicate virtually “face-to-face.” With access to video feed, individuals can exchange non-verbal cues including body orientation and gestures, eye contact and head nodding, and paraverbal speech (such as fluency and fillers like “uh-huh”). Studies show that negotiators using webcams or phones were more likely to agree on a single offer prior to submitting their bid compared to negotiators who solely used written communication. Nonverbal cues are key to establishing rapport which leads to better relationships which ultimately leads to more integrative agreements. • Use video-conferencing to increase understanding. In terms of understanding one another, the actual words themselves play a small role (the tip of the iceberg). Meaning comes predominantly from facial expressions and posture (55%). 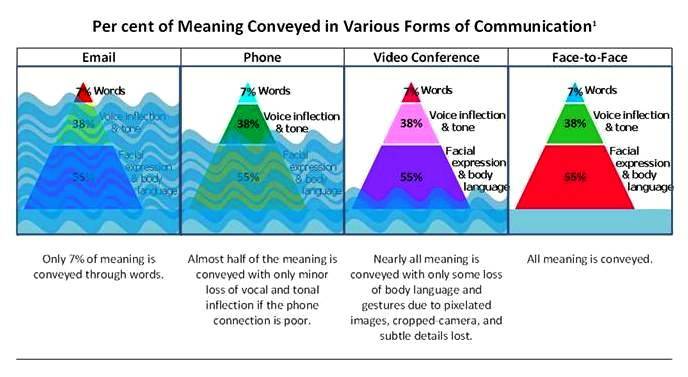 Voice inflections and tone (38%) also contribute to understanding. Only 7% of meaning is conveyed through words. Although face-to-face communication is not always possible in this global society, technology offers a sliding scale of options. See Table 1 below. The phone is more effective than email. Video-conferencing is more effective than the phone. When face-to-face communication is impossible, the chosen method of communication is important. In using technology, e-negotiators have the ability to carefully construct the image they want to portray to the other party. Throughout the process, providing a face in the otherwise faceless process is necessary to build a relationship and create trust for future negotiations. Given the various disadvantages of online communications, negotiators must carefully chose the method of communication and employ video conferencing more frequently to increase understanding and lay a foundation for a relationship of trust.